"Lukasa, or memory boards, are hand–held wooden objects that present a conceptual map of fundamental aspects of Luba culture. They are at once illustrations of the Luba political system, historical chronicles of the Luba state, and territorial diagrams of local chiefdoms. Each board's design is unique and represents the divine revelations of a spirit medium expressed in sculptural form. 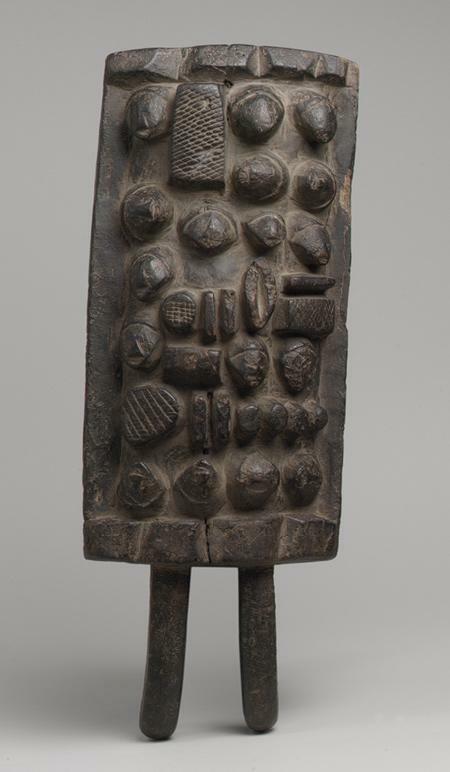 While many lukasa utilize a system of denotation based on masses of shells and beads affixed to their wooden surfaces, this example communicates its content through incised designs and images carved in relief." Fig.1 "Memory Board (Lukasa) [Democratic Republic of Congo; Luba] (1977.467.3)". In Heilbrunn Timeline of Art History. New York: The Metropolitan Museum of Art, 2000–. http://www.metmuseum.org/toah/works–of–art/1977.467.3 (October 2006).